This lesson describes how to float a beach ball on a stream of air. The exercise makes for a magical demonstration in front of a large audience or a lot of fun in an office full of paper. Use it to teach the concept of Bernoulli's principle, which describes the relation between pressure and flow rate. Images attached. For more ideas on Bernoulli's principle, check out our summary curriculum on Bernoulli Effects. Video of the floating Bernoulli beach ball by IncredibleScience. Fig. 1: A ball floats in the center of a stream of air. The air hitting it from below cancels the downward force of gravity. Fig. 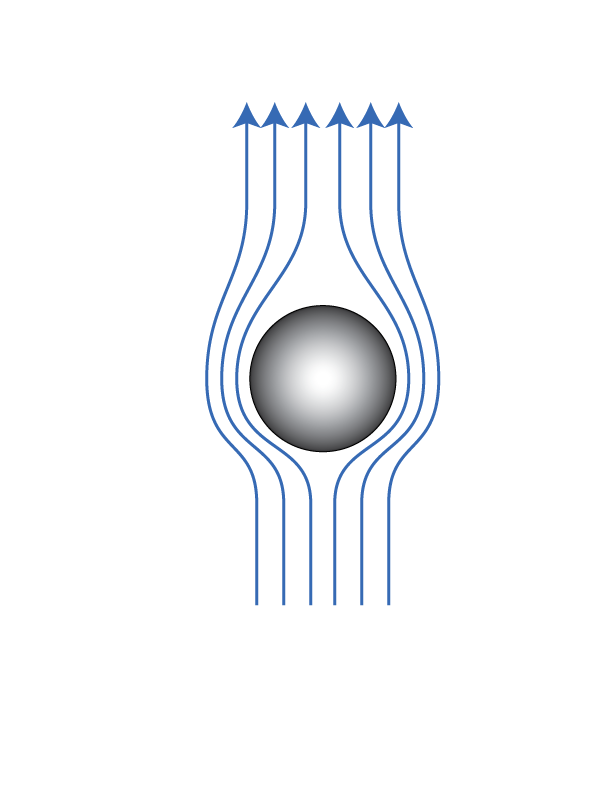 2: A ball moves to the left of the stream of air. A Bernoulli lift force pulls it back to the center of the stream. Fig. 3: The ball moves to the right of the stream of air. The Bernoulli lift force reverses and the ball is once again pulled back to the center of the stream. Fig. 4: A stream of air travels at an angle up and over a beach ball. 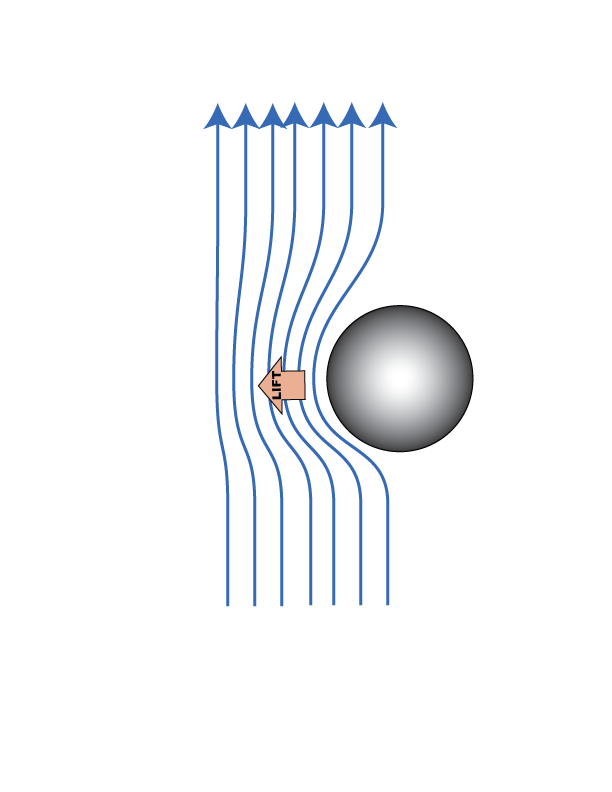 The force from collisions with air molecules tries to push the ball in the direction of the stream. The Bernoulli lift force tries to pull the ball directly into the stream. Gravity tries to pull the ball downward. When these three forces exactly cancel, the ball will stay put. I first saw this magical demonstration at San Francisco's Exploratorium Science Museum in the late 1980's, and I must have spent 20 minutes staring at it trying to figure out what was going on. A traffice cone was positioned over a fan on the floor, directing a stream of air upward, and a beach ball floated on the stream of air, bobbing back and forth. It seemed perfectly reasonable that a fan could lift a beach ball into the air, but I was puzzled as to why the ball never fell to the side, even though it was dancing erratically in the air. The ability of the floating ball to stay on top of the air stream derives from a feature of moving fluid (or gas) known as Bernoulli's principle. In 1738 Daniel Bernoulli published the principle, which states that a region of faster flowing fluid exerts lower pressure on its surroundings than a region of slower flowing fluid. See our lesson on Bernoulli's Principle and the Venturi Tube for more detail. In the beach ball demonstration, Bernoulli's principle comes into play when the beach ball dances back and forth between a region of still air outside the stream and a region of fast flowing air inside the stream. When the beach ball is in the middle of the stream of air (Figure 1), the collision force from the air below counteracts the force of gravity. At the right altitude, the two forces will exactly cancel and the ball will remain at that altitude. 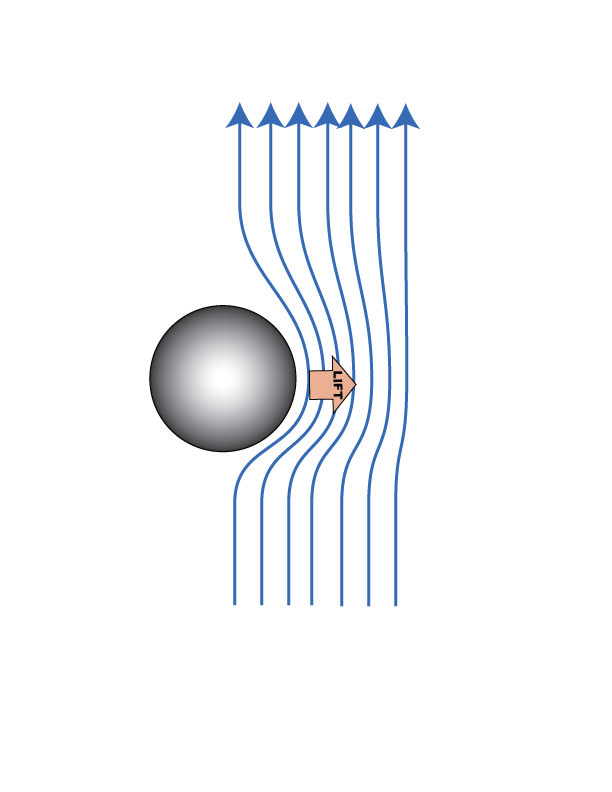 If the ball starts out too low, where the collision force from the fan is stronger, it will rise up away from the fan until the collision force is reduced to the same strength as the force of gravity. If the ball starts too high, it will fall until the two forces cancel. If the ball drifts to the side (Figure 2) then it quickly reaches a point where one side of the ball is outside the stream of air, while the opposite side remains inside the stream of air. According to Bernoulli, the side of the ball inside of the stream feels lower pressure, and the ball is sucked back into the center of the stream. The difference in pressure that pushes the ball in that direction is often referred to as the Bernoulli lift force. As the ball overshoots the center of the stream and moves to the opposite side, the air pressure forces reverse and the ball is once again pulled back towards the center of the stream (Figure 3). In this way, the ball may bob back and forth across the stream, like a child in a swing. The ball can even be made to hang on a stream of air at an angle (Figure 4). 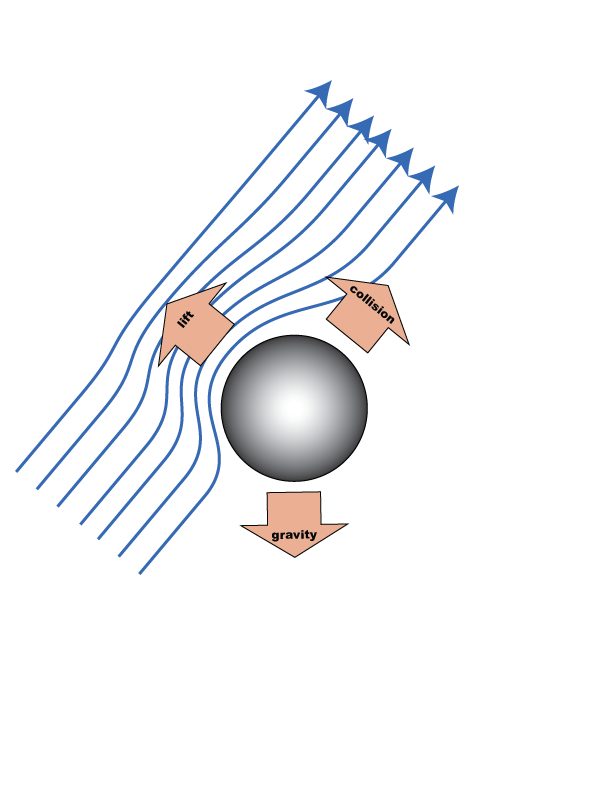 As the ball falls slightly below the center of the stream of air, there is a place where the downward force of gravity is exactly canceled by the upward forces from the collision force and the Bernoulli lift. The ball stays put. Try the experiment yourself with a small beach ball and a leaf blower or shop vacuum with a reverse setting. Be advised that this should probably be done outdoors. The friend of mine who described this experiment to me many years ago had first tried it out in his office, where he stores a great deal of loose paper, with rather spectacular results. Hold the blower vertically and gently place the ball above it, in the stream of air. The ball should find the correct altitude on its own. If it rises quickly and jumps out of the stream, then start again a little higher. If it falls quickly then try again a little lower. To get the ball to hang from an angled stream, start out with the ball on a vertical stream and then tilt the blower slowly. For a reasonably light beach ball, you should be able to tilt the blower as far as 45 degrees. If you don't have a leaf blower at hand you can perform the same experiment with a ping pong ball and a strong hair drier. Often, the best way to introduce students to the Bernoulli beach ball is to describe the setup beforehand and ask them what they expect will happen. Most will say they expect the ball to be launched into the air and then fall off to the side. In that case, the demonstration becomes a discrepant event, which then captures their attention and allows you to ask what could be responsible for holding the ball on the stream of air.